Diva Slicing Cucumber | Gurney's Seed & Nursery Co.
HeightVines grow 5-6 feet long. FruitDark green, semi-glossy, slender, cylindrical, with slightly tapered ends. Best at 5-7" long. Soil RequirementsFertile, sandy, loamy, well-drained soil with a pH of 7.0-7.8. CommentsThis slicing cucumber produces deliciously sweet, bitter-free, seedless, burpless fruit, with a thin, tender skin. It is no wonder this cuke was an AAS winner! Harvest when small, at 5-7 inches, for the sweetest, most crisp, and bitter-free cucumbers that are among the best for eating fresh. Vigorous plants have good pest and disease resistance, and will produce heavy yields of fruit. Adapts well to both protected cropping and open-field production. 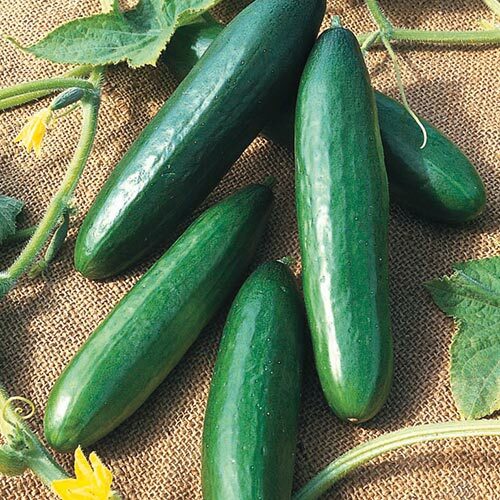 Both gynoecious and parthenocarpic, this cucumber does not need a pollinator to produce heavy yields.